A woman looks out the window on songthaew on the road between Mahachai and Mae Klong in Samut Sakhon. One of the best train trips in Thailand has been the commuter train that runs from Wong Wian Yai station in Thonburi to Samut Songkram (also known as Mae Klong). The train chugs through the Bangkok suburbs into agricultural country before coming to an end in Mahachai (Samut Sakhon). Then you take a ferry and walk to Ban Laem station and hop a second train to Samut Songkram. 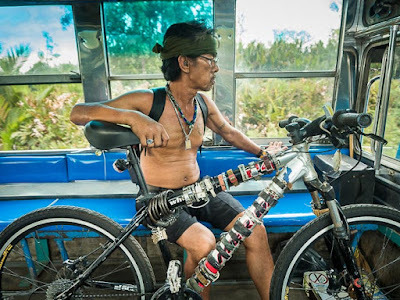 It was a relatively easy trip that passed through a lot of Thai countryside, close to Bangkok yet far removed from the city's hustle. 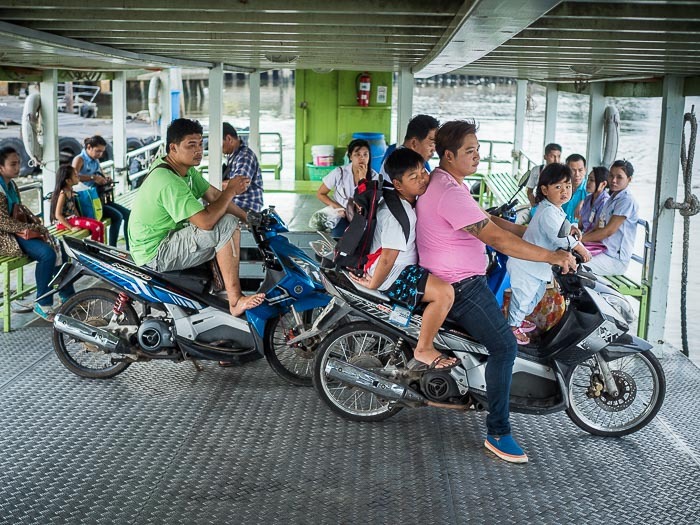 The ferry from Mahachai to Ban Laem. The whole trip was a real bargain. Train fare on each portion was 10Baht (.30¢ US) and the ferry ticket is 3Baht (.01¢ US). So for 46Baht (four train tickets and two ferry tickets) you could go from the heart of the city to one of the more picturesque fishing ports and most unique markets in Thailand. It was one of my favorite day trips. Sadly that's all in the past tense. The second leg of the route, from Ban Laem to Mae Klong is shut down for repair and renovation of the tracks. The repair is expected to take six months and is desperately needed. The tracks haven't been overhauled in a long time. The train has derailed a couple of times and the track bed has been weakened by repeated flooding. 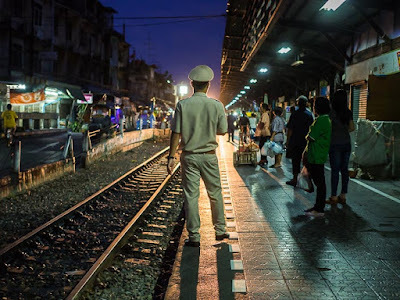 The station master in Wong Wian Yai waits on an incoming train. My plan was to ride the train Wednesday and make a picture story on what was reported to be the last day of service. 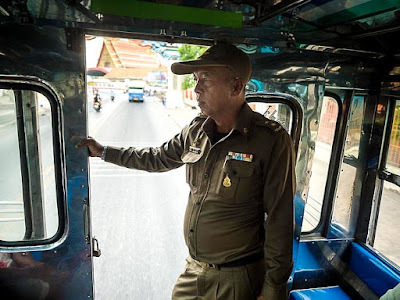 Except service ended Tuesday and Wednesday was the first day of the songthaew (a songthaew is a truck converted to use as a bus by putting bench seats in the back) replacement service. The songthaew going down to Mae Klong went along dirt roads next to the tracks. A scenic, if very uncomfortable and dusty 90 minutes. Coming back the truck roared up a divided highway. A less scenic but also more comfortable ride. A bicyclist in the back of the songthaew to Mae Klong. I went down to Mae Klong, wandered through the market, had a nice bowl of noodle soup for lunch and then made my way back to Bangkok. It wasn't the trip I was hoping for but it wasn't bad. The conductor in the back of the songthaew.